Start by cooking the quinoa. Add the water and juice of half a lime to a medium pot and add quinoa. Bring to boil and then reduce heat and let simmer for 15 minutes, stirring occasionally. While that’s cooking, cook shredded brussels sprouts in sesame oil over medium heat in a large pan. After about 1 minute, add juice of half a lime. Sautee just a few minutes or until brussels sprouts turn bright green and soften a bit. Remove from heat and set aside to cool. When quinoa is finished, remove from eat and set aside to cool. Once both have cooled to room temperature, cover and place in the refrigerator for 20 minutes (if you don’t want to wait, you can definitely eat this dish hot or at room temperature). 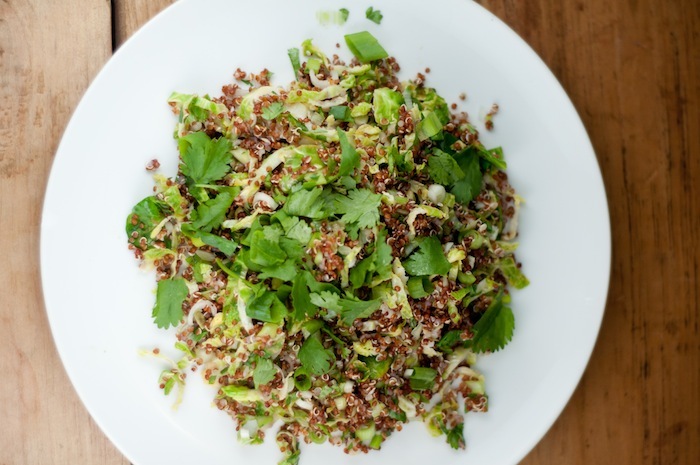 Remove from refrigerator and mix together brussels sprouts, quinoa, scallions and cilantro. Mix in juice of half a lime and a dash or two of Braggs Liquid Aminos or soy sauce. Season with salt and pepper to taste. This entry was posted in Recipes and tagged brussels sprouts, cilantro, lime, liqui, red quinoa, scallions, sesame oil.